The 463rd was known as the "The Swoose Group" because its Group Commander, Col. Frank Kurtz, had named his aircraft "The Swoose". He carried that name forward from a B-17D that he flew in the Pacific prior to being named Group Commander of the 463rd. The original "Swoose" has quite a story behind her. On April 28, 1941, Boeing delivered this particular B-17D (Army Air Corps serial number 40-3097) to the 19th Bombardment Group at March Field, California. On May 31, the group flew 21 Flying Fortresses to Hamilton Field near San Francisco. That evening, twenty airplanes from this group took off and flew 3,864 kilometers (2,400 miles) to Hickam Field, Hawaii. This was the first time that a mass, coordinated flight of land-based aircraft had flown to Hawaii. The Flying Fortresses departed Hamilton Field at five-minute intervals and landed at Hickam with less than six minutes between any two airplanes. For this flight, every crew member received the Distinguished Flying Cross. Soon after 40-3097 arrived in Hawaii, Lieutenant Henry Godman joined the bomber's crew as pilot and aircraft commander. On September 5, nine of the B-17Ds took off and continued flying west to reinforce the Philippine Islands, stopping to refuel at Midway Island, Wake Island, Port Moresby (New Guinea), and Batchelor Field, a Royal Australian Air Force base near Darwin, Australia. On September 12, the group landed at Clark Field, about 80.5 km (50 miles) northwest of Manila, ending the longest mass flight of land-based aircraft carried out to that time. On the night of December 5, a formation of Flying Fortresses that included 40-3097 flew 966 km (600 miles) to a partially completed landing strip at the Del Monte pineapple plantation on the island of Mindanao. 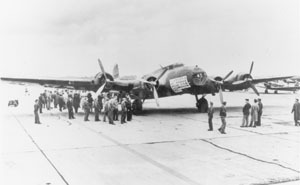 Having successfully carried them halfway around the world, the crew had grown attached to this particular Flying Fortress and they named the bomber "Ole Betsy." They applied olive-drab camouflage paint over the original polished, natural-aluminum finish but they did not formalize the moniker with nose art. Months passed before the airplane acquired her permanent nickname "The Swoose" with distinctive half-goose, half-swan artwork. A few hours after the Japanese attacked Pearl Harbor, "Ole Betsy" and another B-17 made reconnaissance flights around Mindanao--probably the first U. S. bomber mission of the war. In the weeks that followed, Godman flew the airplane on a number of missions from Del Monte to strike at Japanese forces invading the Philippines. On one mission "Ole Betsy" took off to bomb Lingayen Gulf. Soon after taking off, Godman experienced engine trouble and elected to head for an alternate target at Davao Gulf instead of aborting. The airplane arrived over the Gulf in darkness. Using lights and movement in the harbor to aim, the bombardier released his bomb load. The lights scattered and the B-17 turned for home on the last leg of the first U. S. night bombing attack of World War II. At the end of December, she relocated to a new base at Singosari, Java. During a mission to bomb Borneo's eastern coast on January 11, 1942, three enemy fighter aircraft mounted a 35-minute attack. The crew shot down two of the attackers and the B-17 escaped. The damage was extensive enough to end her career as a bomber. She was flown to Melbourne, Australia, for a complete overhaul and fitted with a new tail scavanged from another Flying Fortress (serial number 40-3091). Late in February, Captain Weldon Smith became the new pilot of this restored Flying Fortress. He christened the airplane "The Swoose" after a popular American song about a tormented gander that was half swan and half goose. For an airplane pieced together from parts of other aircraft, Smith thought the name fit well. He flew the airplane for a short time, then moved on. On March 17, another pilot flew "The Swoose" back to Melbourne for extensive engine work. Captain Frank Kurtz selected it to ferry Lt. General George Brett, Commander of Allied Air Forces in Australia. "The Swoose" became the general's personal aircraft. It was in better condition than other B-17s at Melbourne and more complete with radios and armament. Brett flew "The Swoose" more than 150 hours per month across Australia and into the combat zone around Port Moresby. In May 1942, with Kurtz flying, the airplane broke the speed record flying from Sydney, Australia, to Wellington, New Zealand. In New Zealand, the crew removed all armament, lightening the bomber by hundreds of pounds, then broke another speed record during a flight to Honolulu. General Douglas MacArthur relieved Brett of his command in July. On August 4, 1942, Brett left Brisbane and returned home aboard the veteran B-17. Following a brief stop in Honolulu, he arrived at Hamilton Field, California, after flying for 36 hours and 10 minutes. Frank Kurtz had not just set another speed record, he brought home the first American combat bomber to return from the front. On November 9, Kurtz flew Brett in "The Swoose" to his new assignment at Albrook Field, Panama Canal Zone. Kurtz was so taken with the name, that he and his wife named their daughter Swoosie. Born September 6, 1944, Swoosie Kurtz became a stage, screen, and television actress. In July 1943, Frank Kurtz took command of the 463rd Bomb Group. The Army Air Corps also gave him a brand-new B-17G that he promptly named "The Swoose." The B-17 that carried Brett across the Pacific remained as his personal aircraft but Capt. Jack Crane became the new pilot. Crane and "The Swoose" carried Brett to many countries in South America and the Caribbean until late in 1945 when he returned to the United States aboard his adopted executive bomber on October 15. After several short trips around the country, the Army decommissioned the airplane at Kingman, Arizona, and General Brett retired. When Frank Kurtz heard plans to scrap the aircraft, he arranged for the City of Los Angeles to buy the old bomber for $350. The city planned to create a war memorial featuring the B-17. Mechanics hastily repainted the Flying Fortress in olive drab and black and returned it to flying condition. On April 6, 1946, Kurtz flew the airplane to Mines Field, the Los Angeles municipal airport. Among his passengers were the mayor of Los Angeles and Mrs. Kurtz. Following acceptance ceremonies, airport personnel stored the B-17 inside a hangar. But the city's plan for the war memorial fell through and hangar space became scarce and expensive. A new home was needed and once again, Frank Kurtz came to the rescue. He approached the Smithsonian and curator Paul Garber agreed to accept the bomber. In May 1948, Kurtz flew "The Swoose" to the old Douglas C-54 assembly plant at Park Ridge, Illinois. The building served the Smithsonian as temporary storage for a large number of museum aircraft. In June 1950, the Korean War began and the U. S. Air Force claimed the Park Ridge facility for military use. Smithsonian officials abandoned the hangar and on January 18, 1952, an Air Force crew flew "The Swoose" to Pyote, Texas. It was stored there, outdoors, wingtip to wingtip with the famous Boeing B-29 "Enola Gay." Almost two years later, the Air Force agreed to move the bomber to Andrews AFB, Maryland, and store it there with other Smithsonian aircraft. On December 3, 1953, The Swoose began its last flight. This trip was not without incident and during the afternoon of the 5th, two engines quit. At dusk, a third engine failed just before touchdown at Andrews. For the next six years this historic aircraft was stored outdoors at the base and vandals almost picked the bomber clean. Finally, in April 1961, to save what remained of the airplane from total destruction, the Smithsonian disassembled and trucked the 60-year-old veteran to the National Air and Space Museum's Paul E. Garber Preservation, Restoration, and Storage Facility at Silver Hill, Maryland.